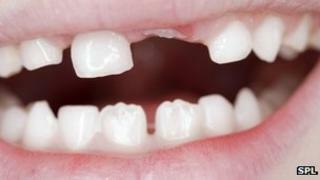 Image caption Could stem cells be a source of new teeth? Stem cells - the master cells which can grow into any type of tissue - are a popular area of research. Cells which are normally passed from the body, such as those from the lining of the body's waterworks, are harvested in the laboratory. These collected cells are then coaxed into becoming stem cells. The researchers said that after three weeks the bundle of cells started to resemble a tooth: "The tooth-like structure contained dental pulp, dentin, enamel space and enamel organ." However, the "teeth" were not as hard as natural teeth. This piece of research is not immediately going to lead to new options for the dentist, but the researchers say it could lead to further studies towards "the final dream of total regeneration of human teeth for clinical therapy". Prof Mason added: "The big challenge here is the teeth have got a pulp with nerve and blood vessels which have to make sure they integrate to get permanent teeth."